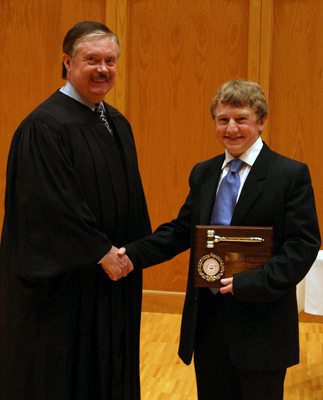 For the third time in the past four years, a sophomore won top honors in the Wabash College and Indianapolis Association of Wabash Men Moot Court Competition. Nicholas Maraman, a sophomore from New Albany, was selected by the distinguished panel of judges as the Top Advocate during the 14th annual competition. See photo album here. "It's just a great honor to win it. It’s a prestigious competition with several rounds to get through," Maraman said. "I got here my freshman year so I was hoping one of my years I’d be able to win." Maraman, who plans to practice corporate or appellate law, thought last year's competition prepared him. He admitted to a few less nerves for this year's finals. He also thought the final judges, a panel Visiting Assistant Professor of Political Science Scott Himsel called one of the most prestigious ever assembled for the competition, was easier than the semi-final grilling. "Actually the semifinal round included Tom Fisher '91 who is taking this case to the Supreme Court and he was a dog," Maraman laughed. "He wouldn’t stop bombarding us with questions." The case, which is written for the students based on an actual case, involved the constitutionality of a state law that requires voters to present photo identification before they can vote. Fisher, Indiana's Solicitor General, will argue before the Supreme Court some time in the spring of 2008. The judges' panel was chaired by Hon. Michael S. Kanne, introduced by Himsel as the highest ranking federal judge in the history of Wabash's Moot Court. Kanne sits on the United States Court of Appeals in Chicago. Hon. L. Mark Bailey is a judge for the Indiana Court of Appeals. Lauren N. Robel is the Dean of the Indiana Law School and didn't miss a chance to give I.U. a recruiting pitch. "I have noted over the years the number of really fine graduates of Wabash who have come through our law school and now I understand why they're so good," she said. She then encouraged all four finalists to consider I.U. Law. Two traditions continued with the inclusion of a Wabash graduate on the panel. John M. Feick '73 is the presiding judge of the Forensic Diversion Program in Delaware County. Dean of the College Gary Phillips took the seat filled each year by a member of the Wabash College administration or faculty. Matt Griffith '89 helped coordinate the Moot Court. He helped create the academic partnership with alumni, students and faculty. The IAWM thanked 26 Wabash lawyers, friends, and professors who helped judge the preliminary rounds. At least 40 Wabash alumni helped in some way during the 2007 competition. Student advocates for 2007 included: Alex Avtgis '11, Barton Bridge '08, Jeremy Burton '08, Kyle Cassidy '08, Craig Cochran '10, Spencer Elliott '10, Grant Gussman '09, Emmanuel Harper '09, Danny Heslep '08, Peter Hewitt '10, Alex Ingram '10, Miles Johnson '08, Daniel King '10, Christian Lawrence '09, Kevin Long '10, Nicholas Maraman '10, Kyle McClammer '08, Travis Mclaughlin '09, Pat McAlister '10, Matt Olivarez '08, Jackson Price '08, Alex Sands '10, Chris Sidebottom '11, Jonathan Torrez '10, Matt Vest '08. The Moot Court competition, a staple of all law schools, is unusual at the undergraduate level. The competition has drawn judges and their praise including three justices from the Indiana Supreme Court, 11 judges of the Indiana Court of Appeals, and six judges from the federal judiciary.